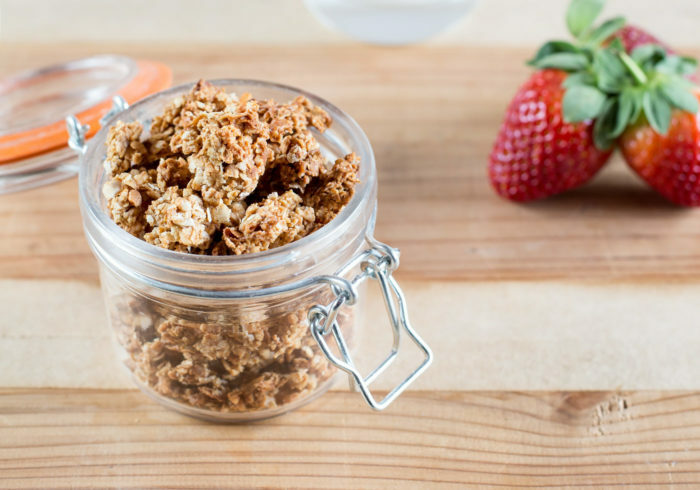 I am so obsessed with this easy Peanut Butter Granola that I make it every week. 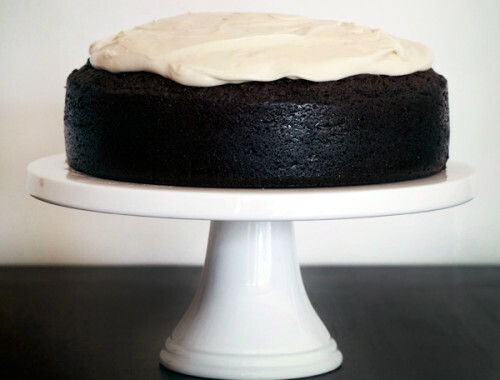 It’s so quick to prepare and bake and the best part is it requires only 5 ingredients! 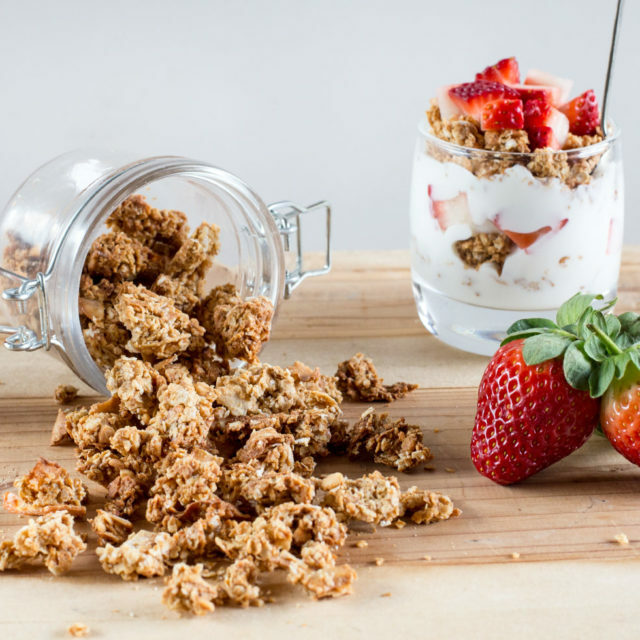 I eat it for breakfast with goat yoghurt and fruit, or pop it into a Tupperware container for a snack on the go. 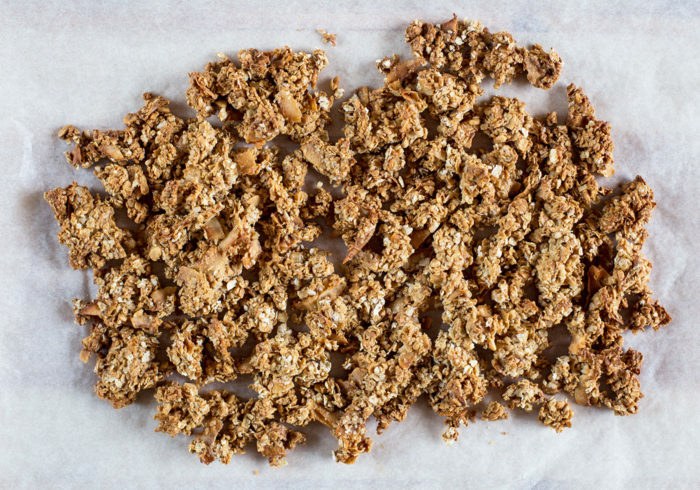 I am a huge fan of making my own granola because a) I have a range of really annoying food intolerances so I can’t buy most store-bought ones and b) most of the packaged kind have unnecessary sugar or processed ingredients added. There are some great high-end granolas available now but they can be seriously expensive. And I figure there’s no reason to be shelling out your precious pennies on breakfast when you can easily make it yourself! 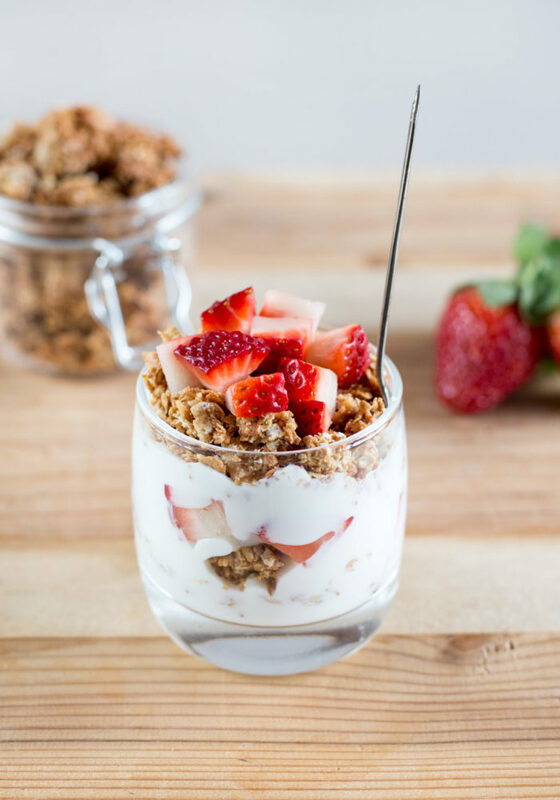 Whilst I adore making my Swah’s Granola or Chocolate Spiced Granola now and then, both these recipes require a long list of ingredients and often a trip to the health food store for special ingredients. 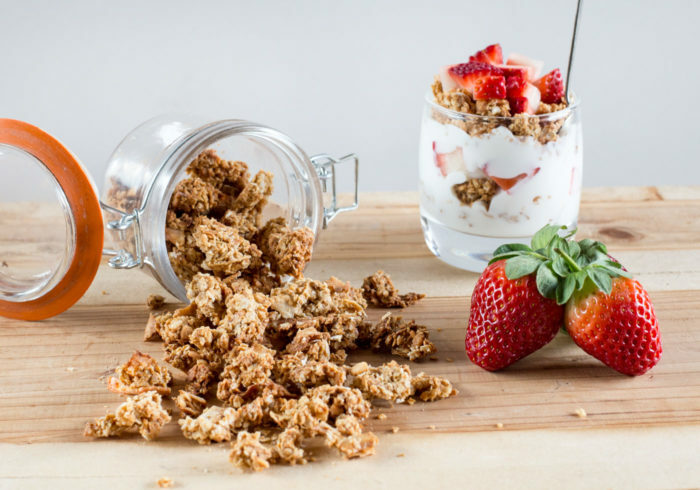 This recipe on the other hand features ingredients I always have in my pantry, meaning I can satisfy a granola craving within 15 minutes. 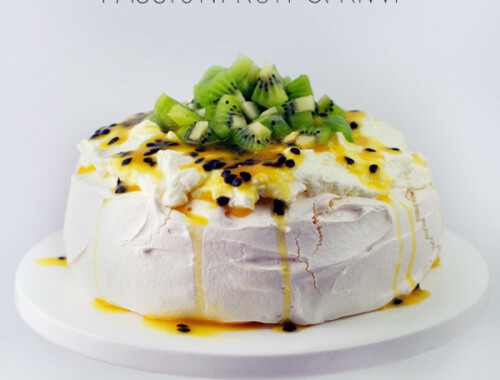 This recipe is easily adaptable depending on your taste preferences and what you have on hand. You can easily substitute the peanut butter for almond or cashew butter, swap the rice malt syrup for honey or maple syrup, exchange the cinnamon for ginger or a spice of your preference, and omit the coconut flakes in favour of seeds. Preheat oven to 180℃ and line a baking tray with baking paper. 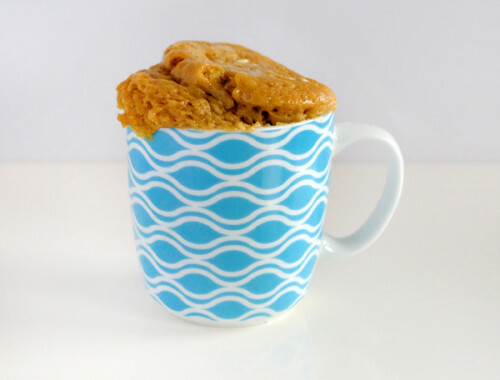 Combine the peanut butter and rice malt syrup in a microwave-proof cup and heat on medium for 30 seconds or until melted. Add the melted peanut butter and syrup mixture and stir until all dry ingredients are evenly coated. Spread the mixture evenly on a baking tray and bake for 10 minutes, or until golden brown. What’s you’re favourite breakfast food? 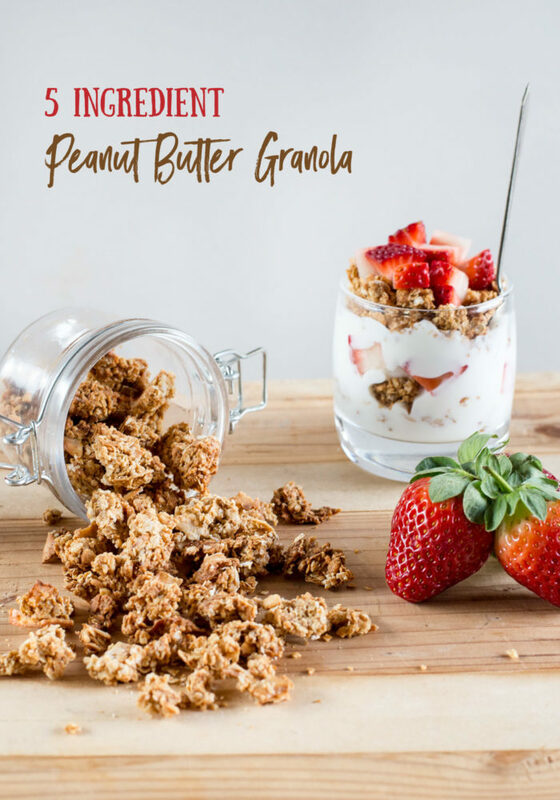 Peanut butter granola is a very tasty and yummy..